Top of Da Food Chain! We have arrived at the very last and final hot dog on the Sterns’ Roadfood “Eat Before it’s too Late” list. There were sixteen hot dogs on the list. And that’s absurd. Fortunately (unfortunately? ), three of the places on the list were closed by the time I got around to trying to eat at them. So yeah, I “only” had 13 hot dogs that Michael Stern deemed important enough to eat before I die out of all the food available at all the places to buy prepared food in the entire country. I had tried to get a Top Dog dog many times over the years of complating this list. I had a pretty good idea where they parked their hot dog hot dog truck in Portland, but never seemed to find it in operation when I was down there. They have almost zero web presence and even when you go to their Facebook page, the linked website goes to some other Top Dog joint in another state. 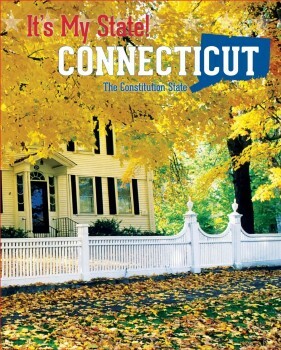 Then, when I had pretty much written them off as closed and forgotten, I was with Damian driving up route 66 to go hiking in East Hampton. It was maybe 10 AM or so and I passed the Top Dog dog mobile driving the other way, heading towards the parking lot in which they sit! My day’s plans were taking us to Hurd State Park, then the abandoned town in Moodus, then to our friend Jon at Steady Habit Brewing in East Haddam, lunch in Middletown at O’Rourke’s and… now a quick trip back across the river to Portland to finally get my darn Top Dog. Here’s a video of the Top Dog experience from 2010. Nothing has changed. Exkept the price. Of course. There is a mannequin guy in the back seat. He will creep you out, I promise. 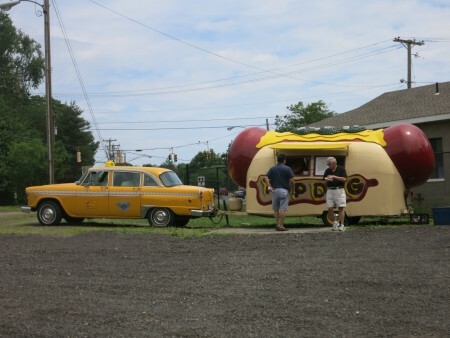 If you are a hot dog lover passing through central Connecticut between March 1 and November 1, Tuesday through Saturday, between 10am and 3pm, you need to know about Top Dog. There are no phone number and no address, but spotting this jolly dog wagon is a breeze. Heading towards Middletown from the east on Route 66, look left around High Street. 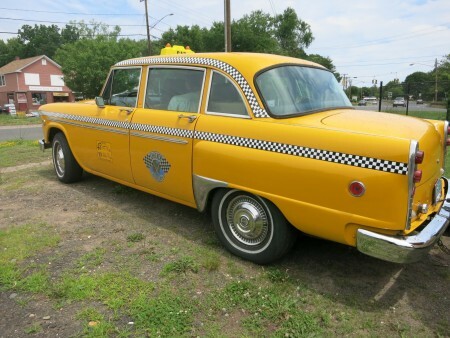 See the vintage yellow Checker cab in perfect restored condition? More amazing than that, look what it is pulling: a 1963 Airstream trailer that has been converted into a humongous hot dog. It is at a window in the side of this truck-size dog (which, by the way, is nestled in a bun of stainless steel and topped with architectonic mustard and relish) that you tell proprietor Andrea Spaulding what kind of wiener you like. They are plump, full-flavored franks with a nice snap to their skin, and while you can order one with regular mustard and/or relish and/or ketchup, Andrea has concocted a bunch of specialty combos. These include a cheese dog, a chili dog, a pepper dog (fried peppers and onions), a bacon cheese dog, a kraut dog (“topped with old fashioned slow cooked sauerkraut”), a fire chili dog, and an Orleans dog, which is dressed with relish from the Crescent City. I pulled into the lot. I ordered a hot dog with mustard through the incredibly tiny order window. I tried to take a few pictures, but for some reason the other customers were all giving me the stink eye. It was kind of weird – but the woman inside the hot dog trailer was super nice. There it is. A hot dog. I paid for my hot dog and got back into my car and drove off, again with other customers staring at me. I think it’s a Portland thing. 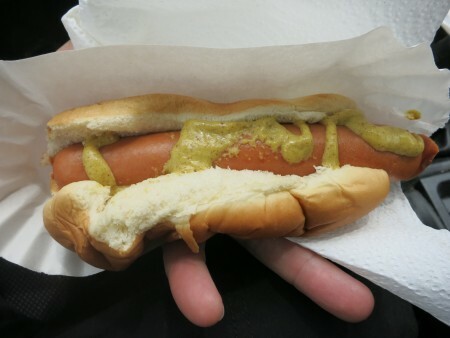 I had to get away from those weirdos to do the perfectly normal thing and take pictures of a hot dog, and then a picture of me eating that hot dog, and then going home and writing a one-thousand word essay on said hot dog. What don’t those people understand?! I ended up in some industrial area basically underneath the Arrigoni Bridge on the Portland side. It was kind of a neat place, actually. These are Thurman’s natural casing dogs and they have quite a snappy snap to them. 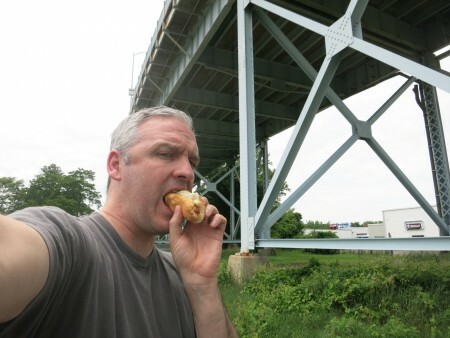 I ate my dog under the bridge and reflected back upon the 12 other hot dogs I’ve eaten to complete this list. Was there a “best?” A “worst?” Not really… hot dogs are hot dogs, y’know? And if I’m paying three bucks or more for them, they better be good, insofar as hot dogs go. The Top Dog was good, and the experience with the checkered cab and the hot dog trailer are a lot of fun. I wish I could be more floral with my language, but… yeah. Thirteen hot dogs just sort of take that out of me.